Page view compliments of StellaLife®, Inc.
Let your patient know that this is an all-natural rinse to aid in healing. The gel can be used under dentures. Use all three Recovery Kit products in the order outlined in the Patient’s Application Guide. Start with the rinse, then spray, followed by the gel. 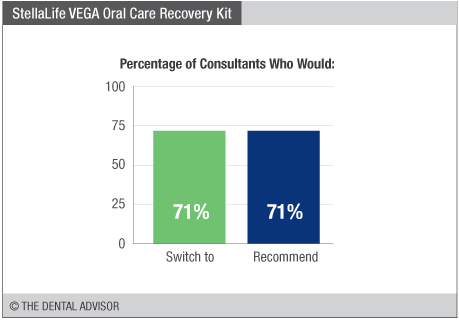 StellaLife VEGA Oral Care Recovery Kit was evaluated by 7 consultants. 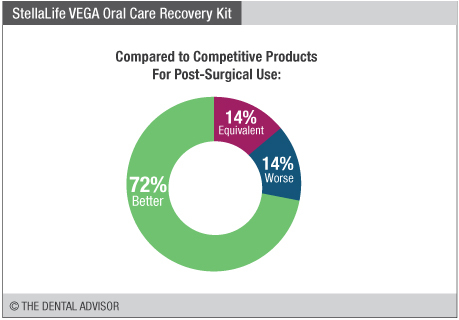 The StellaLife VEGA Oral Care Recovery Kit is formulated to improve dental patients’ postsurgical recovery after wisdom teeth removal, extractions, placement of dental implants, bone grafting, osseous surgery, connective tissue grafting and other oral procedures. Pain, swelling, and bruising relief. Relieves oral ulcers, dry sockets, dry mouth, cold sores, sores associated with dentures and mucositis (gel and rinse). Hydrates oral cavity (gel and rinse). Promotes healthy gums (gel and rinse). 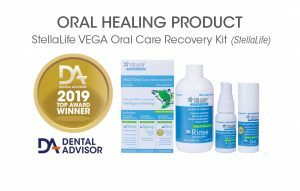 StellaLife® VEGA® Oral Care Recovery Kit consists of a homeopathic antibacterial rinse, gel and a spray that provide pain relief, reduce inflammation and edema, accelerate healing and post-operative recovery. 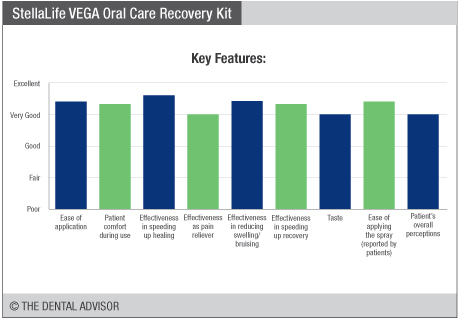 StellaLife VEGA Oral Care Recovery Kit contains an 8 oz. bottle of rinse and a 1 oz. bottle of the gel and spray. Rinse can be used as part of routine daily oral hygiene. It kills bacterias that cause cavities and periodontal disease, hydrates oral cavity, freshen breath. Patients should refrain from eating or drinking for 20 minutes after using the products. The gel and rinse can also be purchased separately. Start 3 days before the surgery to increase therapeutic levels and continue 7 days after. Use rinse first, then spray and followed by the gel 3-4 times per day, after meals. Refer to Patients’ Application Guide on their website. This product received a 91% clinical rating.